Urbanization is the transformation of rural populations into urban populations—the process by which a nation’s population becomes concentrated in cities and towns. As people migrate from the countryside to the cities, the structure of the economy, the standard of living, and the shape of society all undergo changes, leading to an overall increase in quality of life. During the socialist era, population flows were strictly controlled. Almost all migration during this period, such as the movement of Han populations to border areas, happened under the auspices of the government’s planned-economics policies. Only after Reform and Opening Up did the market begin to dictate population flows. 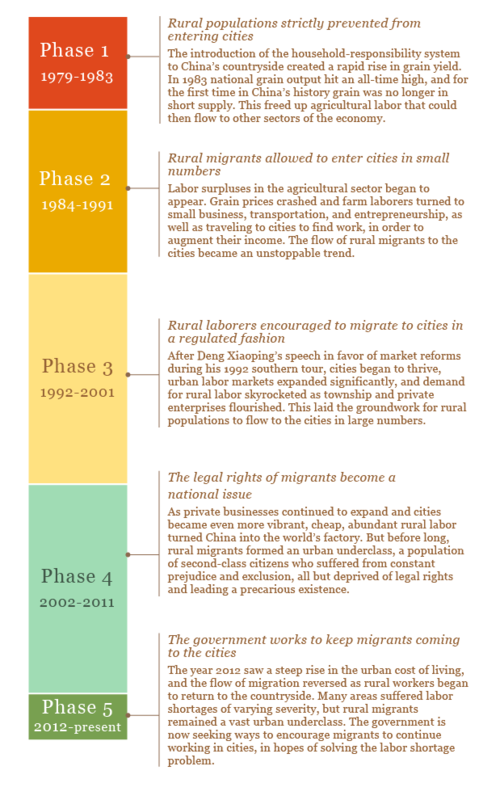 This process can be broken down into five phases. In 2012, China’s urban-to-rural ratio exceeded 50%, reaching the worldwide average. But behind this seemingly miraculous achievement lies a host of uncomfortable facts—for example, huge numbers of city dwellers still lack official certificates of urban residence (hukou). Why is it so hard for rural migrants to settle permanently in cities? City dwellers were the first to get rich after Reform and Opening Up, which created a large income disparity between them and people living in the countryside. Naturally, first-time migrants to the cities had no money, and high real estate prices made it hard for them to buy homes. But the most valuable property that rural migrants possess is their own land back in the countryside. 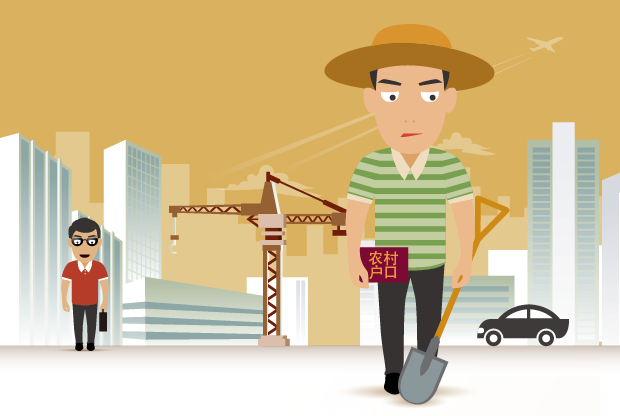 Because land cannot be bought and sold freely in China, rural migrants cannot sell their land directly to developers, and when their land is developed, they only receive meager compensation for it. 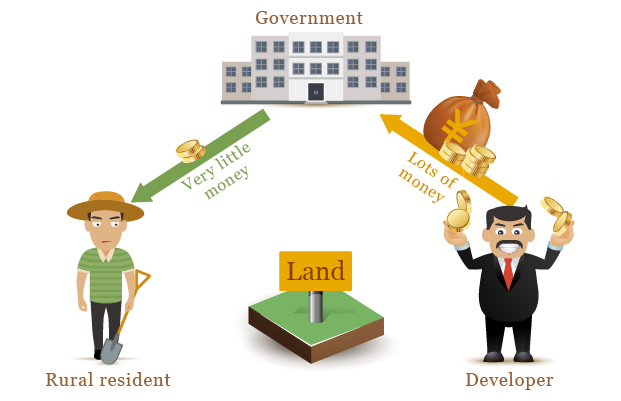 However, developers must pay huge land transaction fees that greatly inflate the price of real estate. Therefore, rural residents who lose their land get very little compensation for it, which makes it impossible for them to afford steep urban housing prices. As a result, most newly arrived rural migrants can only rent in cities, rather than buy. 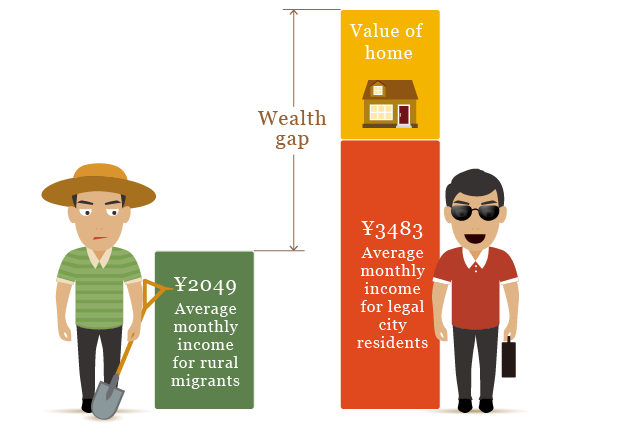 Because of the legal residence (hukou) system, many rural migrants cannot enjoy the same social benefits that legal urban residents do, including public services like education. As a result, the percentage of rural migrants covered by social welfare programs is very low. In addition to the problem of social welfare, the income gap cements migrants’ status as an urban underclass. Because land cannot be bought and sold and urban real estate prices are soaring, there is an even greater gulf between legal urban residents, who already own homes, and newly arrived rural migrants. This makes the urbanization process even more unfair for migrants. In conclusion, urbanization is about assimilating people into city life, and this means, in addition to providing housing for rural migrants, that the government and city residents must work together to ease the transition. At present, restrictions on the sale of land and the rigid legal residence (hukou) system prevent migrants from integrating fully into city life. If these two problems cannot be solved, then China’s newly built cities will fall into blight. Urbanization isn’t just about building more houses!